Once Europe's supreme maritime power, Spain by the mid-eighteenth century was facing fierce competition from England and France. England, in particular, had successfully mustered the financial resources necessary to confront its Atlantic rivals by mobilizing both aristocracy and merchant bourgeoisie in support of its imperial ambitions. Spain, meanwhile, remained overly dependent on the profits of its New World silver mines to finance both metropolitan and colonial imperatives, and England's naval superiority constantly threatened the vital flow of specie. When Charles III ascended the Spanish throne in 1759, then, after a quarter-century as ruler of the Kingdom of the Two Sicilies, Spain and its colonial empire were seriously imperiled. Two hundred years of Hapsburg rule, followed by a half-century of ineffectual Bourbon "reforms," had done little to modernize Spain's increasingly antiquated political, social, economic, and intellectual institutions. Charles III, recognizing the pressing need to renovate these institutions, set his Italian staff―notably the Marqués de Esquilache, who became Secretary of the Consejo de Hacienda (the Exchequer)―to this formidable task. 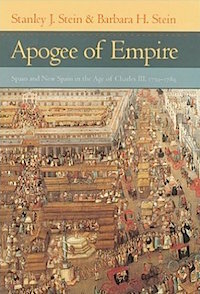 In Apogee of Empire, Stanley J. Stein and Barbara H. Stein trace the attempt, initially under Esquilache's direction, to reform the Spanish establishment and, later, to modify and modernize the relationship between the metropole and its colonies. Within Spain, Charles and his architects of reform had to be mindful of determining what adjustments could be made that would help Spain confront its enemies without also radically altering the Hapsburg inheritance. As described in impressive detail by the authors, the bitter, seven-year conflict that ensued between reformers and traditionalists ended in a coup in 1766 that forced Charles to send Esquilache back to Italy. After this setback at home, Charles still hoped to effect constructive change in Spain's imperial system, primarily through the incremental implementation of a policy of comercio libre (free-trade). These reforms, made half-heartedly at best, failed as well, and by 1789 Spain would find itself ill prepared for the coming decades of upheaval in Europe and America.